Whether you have a hankering for ham or a sudden yearning for ice cream and pickles, cravings during pregnancy make it nearly impossible to focus on anything but the munchie of the moment. My own cravings consisted primarily of malted milkshakes and fountain sodas (Cherry Coke and Dr. Pepper to be exact). There wasn't a day when you'd pass my office without seeing a smattering of cups littering my desk. Candy was another favorite-- so much so that a co-worker commented that I must be making a real "stud-muffin" with all the sugar I'd been consuming. 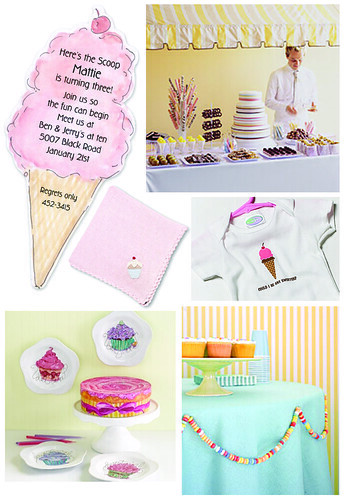 Cravings are such a fun part of pregnancy and would be a great concept to center a baby shower around. Brightly colored candy and cakes make this sweet inspired shower the perfect way to satisfy the sugar momma in your life. Whimsical cupcake dishes -- Rosanna, Inc.